As a long-time New Yorker I’m probably among the least qualified to comment on the state of our State manners. After all, rude people generally don’t think they’re rude. And so it is with me and New Yorkers. I don’t find us particularly discourteous, but Friday’s bitchy rant got me thinking a bit more about the topic. Now it’s completely possible that I’m missing something, but it seems to me that the “New Yorkers are rude” critique misunderstands something important about life in the city of New York. There’s a simple explanation for why we act the way we do. There are more than 8 million of us packed into an area smaller than some U.S. farms. That doesn’t excuse bad behavior, but it does change what it means to be rude, at least in some instances. Take the neighborly wave, for example. In small towns and suburbs across the country it’s commonplace for strangers to exchange some form of acknowledgement, a wave of the hand or a nod of the head, whenever passing one another. It’s simply polite to say hello. It’s also something New York City dwellers generally don’t do. Not because we’re impolite, but because there are far too many strangers to acknowledge. It is one thing to smile and wave at the third person you pass on the way into work. It’s another thing entirely to do the same to the three hundredth. We simply can’t do it, so we don’t. Something similar is true for sales clerks. We’ve met plenty of chatty store owners around the country who genuinely want to talk to us, hear our story and share theirs. That’s great, as long as the store is empty. But when there’s a line of customers waiting to check out, that same chatty behavior stops being friendly and starts being inconsiderate. In a small town it’s nice that everyone knows your name. But in a high-traffic area like New York, the most considerate thing a store owner can do is keep the line moving. For that reason we New Yorkers not only appreciate brisk efficiency, we understand that without it we’d get little more accomplished in a day than procuring our first cup of coffee. So when we walk past you without making eye contact or when that brusque salesperson whisks you through a line with grim efficiency, don’t be insulted. But don’t thank us either. We don’t have time for pleasantries. Indifferent is probably a better word. In searching for a reason why so many people seem to think New Yorkers are rude its the best explanation I could come up with. But I’m open to the idea that because I’m from New York, I don’t see the actual rudeness that everyone seems to. I was hoping someone could enlighten me. You are so right. I lived in the City for almost 20 years, my whole family is from there – and then I moved to quiet South Carolina for 8 months and life was a little lighter, space was more open and free and people were very friendly. There are rude people everywhere but the size of the population vs. the size of the territory is something I’ve often thought directly related to how people interact. Although when the chips are down, as us NYers have seen in times of tragedy, we can also put aside our petty annoyances of daily life and get down to the basics of what really matters and we come together like one big family – we understand each other because we’ve all been through the trials and joys of city living and we know that no one understands a NYer like another NYer. Of course, it also doesn’t take us long to snap back into normal “indifferent” mode (as Kattrina said). Every family has a bit of dysfunction – and New Yorkers, as a “family” are no different – just a little indifferent. Great article. We like the energy of a big city too. And not just New York. Anywhere that has vibrant local street life appeals to us. New Yorkers didn’t come across as rude to me when I visited. On the contrary. I guess they had big city ways but a lot of people still took the time to notice, help, greet, and even include me. I wouldn’t last a day in that city. No tolerance. I agree with the tolerance issue . Ok they don’t have time for politeness but a smile now and then costs nothing. I went to new York from England believing the myth that it was a vibrant friendly city what a shock I had . Most people looked miserable and bland and the customer service was darn right rude. Like it was always an effort to serve you. Give me London any day! I agree with “B”. My son who was there last year, and has traveled the world, said he experience very helpful people. I MISS NEW YORK CITY!!! I have no opinion on “the rudeness of New Yorkers” as I have never been to the city and the ones I have know have immigrated to Canada. I am curious though, because you are from a very populated place, does this influence the type of travel you choose to do? Do you prefer places with people and lots of amenities, or are you equally comfortable out in the middle of nowhere with few (if any) services and no people? I am very interested as it ties into a discussion I had recently with my husband. That’s a good question, Deb. I think we’re unusually fortunate in that Shannon and I really do appreciate and enjoy a lot of different types of environment. We absolutely love our national parks, we enjoy hiking and seeing wild critters in their natural habitat. We still think our best travel experience to date was a week-long rafting trip down the Colorado River through the Grand Canyon where we pitched a tent each night and bathed in the river each day. At the same time, we’re drawn to the energy and cultural richness of places like New York and Paris. We love art and architecture and international cuisine. So from a travel perspective, it’s all good. I hope this blog reflects that. But when (and if) we get ready to settle back down somewhere, it will be a place where everything we want on a day to day basis (food, medicine, entertainment, etc) is within walking distance. And that means we’ll be looking for a good sized city. I have one more question for you as I am working on a project involving a very rural area. What types of tourism possibilities, attractions or amenities would make you consider visiting a very rural area for a day, weekend or week? I think your perspective could be quite valuable to hear. The possibilities are almost limitless. An obvious reasons to go somewhere rural is to see natural beauty, and that is something we do regularly. We’ve also volunteered at a large animal shelter in remote Utah. I see us going back there, at some point, and also volunteering in poverty prone areas around the world. We could go somewhere for a unique experience (work on a cattle ranch perhaps or making wine) or to experience different cultures (maybe take the Siberian railway across Mongolia) or to witness incredible animals in their natural environment (go on a gorilla trek in Gabon). Those are just a few of the things that come immediately to mind. As we travel and see what the world has to offer, I’m sure that list will grow. Thanks Brian. Natural beauty and unique experiences are great points that will work for this area. Thanks for the input. I grew up in Boston, but gradually moved to a more rural setting. When returning to the “big city’ with my handicapped husband, I found folks at the airports back East to be extremely inconsiderate of his disability, shoving into him and generally being extremely rude and annoying. I hear you about needing efficiency over connection in cities, but I personally prefer not to live that way. I find the “energy” level of big cities to be draining rather than invigorating. It’s kind of nice when you have that choice. I never noticed anyone being rude when we were in NYC – apart that is from art gallery security guys who treated bottles of water as if you were attempting chemical warfare. It didn’t matter that there was a heat-wave outside – can the water. Phew! We got over it and went and drank iced coffee in Central Park. Wow, never had water bottles confiscated except at the airport. I did, however, get in trouble at one non-NYC museum for taking notes in pen – only pencils allowed. And I also got yelled at quite vigorously in the Rijksmuseum for carrying a bag or an umbrella or something. I don’t know if I didn’t see the sign or couldn’t read it because, ugly American that I am, I don’t speak all the world’s languages. The big misunderstanding here I think is that rudeness isnt an abstract thing. What for one is rude isnt for the other. 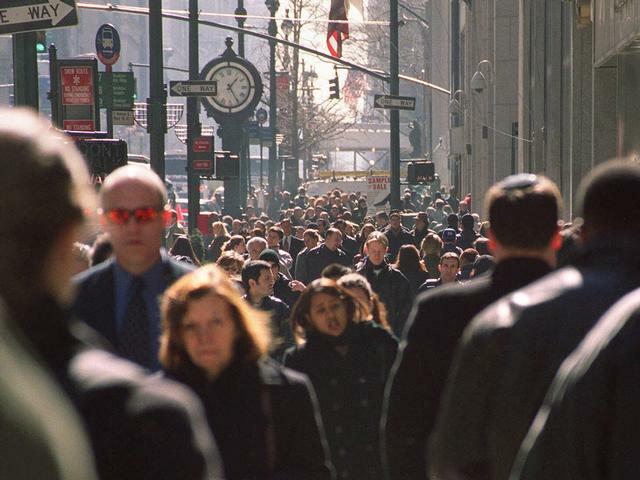 Aparantly New Yorkers have a somewhat different concept of rudeness (compared and opinionated viewed by other Americans) and which is in all probability the result from living in a big city like New York. So when someone with another concept of rudeness like someone from rural Ohio visits NYC a couple of days and gets some ‘rude’ experiences from his Ohio concept of ‘rudeness’ and then back home immidiately concludes ALL New Yorkers are rude then this person isnt only narrowminded but also himself rude becaue he thinks he knows what rudeness is. I find Americans very friendly (mc Donalds smile people) and politie people certainly compared to some here in Europe (Netherlands) and if you like to see some real rudeness visit Amsterdam (or some mayor big European city) and your former concept of rudeness will be totally changed;-)! I think there’s a difference between being a bit charmless by essentially ignoring others, which you’re describing, and being actively rude by insulting them when they ask if you have a table free in your restaurant, for example, or want to know the price of something you are selling in your shop. We Londoners do the firmer, for the same reasons you have sensibly described, but we don’t do the latter – that is about respect, and there seem to be too many people in New York who don’t have it for others. We lived in and around NYC for about 20 years. During that time I can’t recall ever being insulted when asking for a table or a price. I’m sure it happens occasionally (we’ve encountered rude and insulting people everywhere), but are you sure that what you’re describing is really representative of New Yorker behavior? I worked in New York on and off for months and I was repeatedly left speechless by inults, belligerence and pig-headed arrogance, that just came out of nowhere for no reason. After a while I realised there are lots of bullies in NYC and if you are domineering straight off, they treat you with respect and are sometimes even a bit of grovelling. Like all bullies, they are wimps if you act like the bigger bully. Despite hating these people in NYC I always had a fantastic time, every time I was there, and made lots of new friends who I stay in touch with a love corresponding with 15 years later. So as you say, notveryone in NYC is like that. Interesting. That isn’t our experience at all. Having just returned from NYC several days ago I can’t recall a single instance of bullying. What I remember, though, are the two different people who asked to help someone looking at a subway map, the guy who offered his seat to an elderly woman on a crowded train, and even the middle-aged man who offered his seat to a younger woman. All of this is anecdotal, of course, but it’s almost like we’re talking about two completely different places. It is as if we’re talking about different places! I come from London and people sometimes say the people in London have been rude to them, yet it has bever happened to me. I supopse in a big city, everyone has a different experience. Waiting in a queue for half an hour, to have not even a hello when u get to the front, and have the ‘briskly efficient’ salesperson stand for another 5 minutes talking to their colleague about the weekend, then when they can’t scan your item (still not having acknowledged your presence) they declare ‘I can be assed walking over there to get a new item to scan’ which was 5 yards away, I got an insight into this ruthless efficiency you talk of! Ok everywhere has poor salespeople, but this was a repeated experience in over 75% of my contacts with New Yorkers, from hotels, to restaurants, to taxi drivers, to asking for directions off the man on the street. Uninterested, unhelpful, RUDE, and most definitely completely inefficient was exactly what we got. I can deal with the bustling streets and busy transportation, and most definitely wouldn’t expect to exchange pleasantries in such circumstances, but this excuse does not cut it when in direct contact. One of the things we’ve learned in the comments section of this post is that everyone seems to have different takeaways from their own experiences. Having lived in and around NYC for over 20 years, I don’t really see anything recognizable in what you describe. At the same time, I feel like everywhere else I go the service is considerably slower than what I ordinarily experience in New York. It’s hard to say which of our experiences is more representative. But I can’t help but think that your average shop located in a city of 8 million people is going to have to be more efficient than one located elsewhere. Not only do they have to be more efficient to keep the queues from growing out the door, but if they don’t and I see they have a long line, I can almost always walk down the block and give my business to a competing shop that does things better. You don’t get that kind of competition in most other places and that tends to keep businesses on their toes. The excuse if population doesn’t cut it. I’ve traveled 48 countries and have been in cities like London with 12 million and Cairo with 20 million and find the kindness and manners uneffected by population . After 48 countries and having lived in 4 I can tell you New Yorkers are the rudest mouthiest people on the planet. The smug sarcastic Jews and big mouthed Italians set the framework that others fill in. About the biggest punishment that could be given New Yorkers is to have to live amongst other New Yorkers. Well, aren’t we the bigot calling the kettle rude? I was born and raised in Upstate New York, and I’d say that most of the Upstate New Yorkers I have met are not rude. If you come to Upstate New York, I’m sure you will find that most of us are friendly and laid back, and that the environment is a little more relaxed than NYC. New York City and Long Island are pretty flat, whereas much of Upstate New York is rather hilly and mountainous. As a Buffalo NY native, after a local woman bullied my 77 yr old mother and me out of a handicap parking space, I can’t wait to return home to the “City of Good Neighbors”. The woman got out of her car and threatened us. We we at a shopping outlet in Elizabeth NJ. I gave her the space and drove to the valet lot. We were at the space first, but….. No one ever treats our Canadian shoppers with such barbarism when they cross the boarder to add to our local Western NY economy.